We planned a trip through Europe to coincide with meeting a friend in Cyprus, so we had time restraints with travel. We wanted to spend most of our time in France and Italy but not miss some sites in the countries surrounding them. Consequently we opted for a train trip from France to Italy, going through The Alps. Tanya from TTGolf booked our accommodation and fast train tickets, including excellent accommodation in Zurich, Salzburg and Venice where that leg of the train journey ended. The aim was to relax and absorb the scenery through Switzerland and Austria and see the countries that we would not have ordinarily gone out of our way to see. We stayed overnight at Zurich described a beautiful city, and worthy of a couple of night’s stay and a city tour. Our aim this night was to rest and have a nice meal, rather than to rush sightseeing in the evening. Our next day’s train took us to Salzburg in Austria, the gem in the trip. 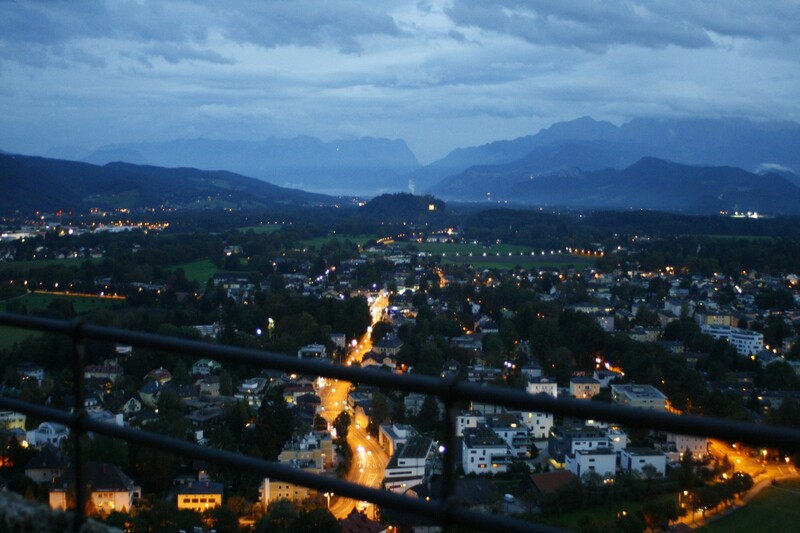 We thought we went to heaven and arrived in Salzburg! Arriving by train the Hohensalzburg Castle looms up above the town. Its a fairytale sight. We had one night, so quickly decided to walk to the Castle if possible. We were in the right place at the right time. 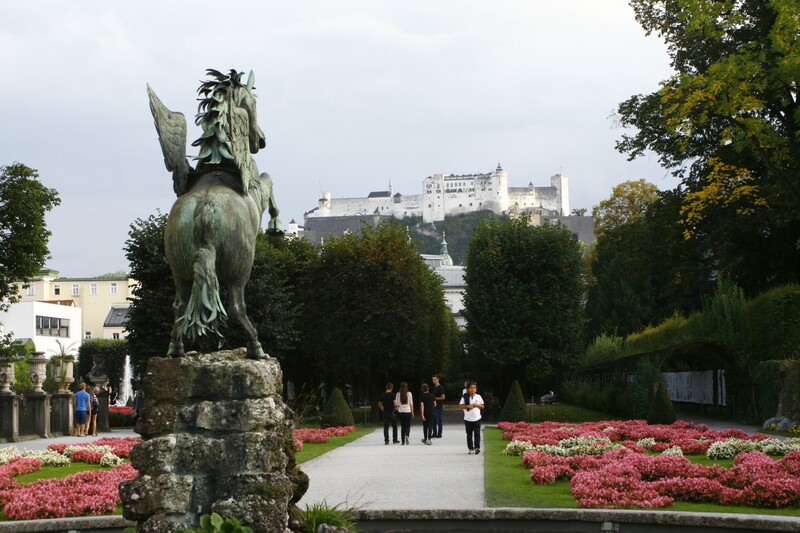 Upon catching our breath at the Mirabell Castle gardens in the afternoon, whose gardens direct your gaze to the Hohensalzburg Castle we kept the castle in site as we walked towards it, crossing the Salzach river. To our delight the St Rupert’s Fair was in full swing and there were Austrians everywhere in full cultural dress. 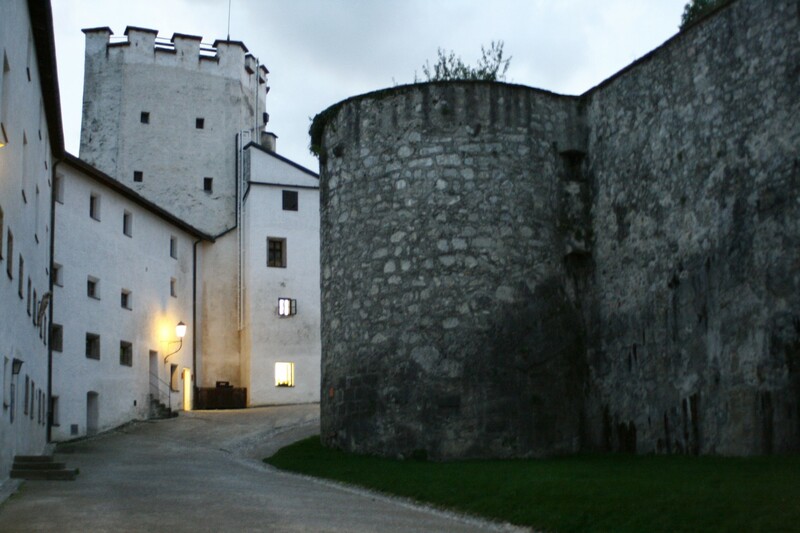 We managed to wind our way up to the castle, enter and sightsee and to our delight, have an Austrian beer and local sausage platter within the castle walls. What an evening! We descended from the Hohensalzburg Castle to Salzburg city in party mode and thick crowds of young Austrians all in cultural dress having a very good carnival time! Thanks be to St Rupert for a lovely night. St Ruper’ts Fair is 21-25th September in 2016. Salzburg is the town of Mozart and there are Dinner and Music Ensembles playing Mozart, Haydn and Dvorak and Strauss in the castle which I would have booked if one was available. the Salzburg Festival showcases music events and would well worth visiting at this time. The original Sound of Music film starring Julie Andrews had location shots in Salzburg and there are bus tours showing the film locations for the Sound of Music. I believe there are music events featuring The Sound of Music from time to time. The next morning, we boarded our very fast train again. Austria was my favourite part of the Alps. Thanks to Tanya from TTGolf making suggestions about the accommodation and the most economical way to travel with Eurail train tickets. We thoroughly enjoyed the train travel down to Venice where Tanya had booked a lovely little room in a hotel on the Venetian gondolier waterways and within a walk to the Piazza San Marco with delightful Trattoria’s along the way. Click on the picture above, to connect with our valued partners, prebook your day tours and airport transfers now.